The Amarillo Rifle & Pistol Club offers an extensive and varied smallbore rifle program, including outdoor prone league and tournament matches and indoor position league and tournament matches. 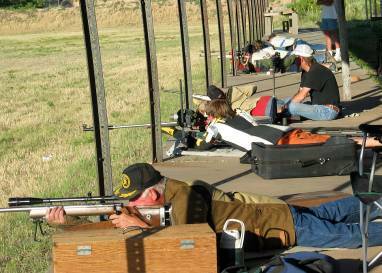 Outdoor prone matches are held on the Club’s 100 yard Smallbore Prone Range, located just north of the Indoor Range. This outdoor range is one of 2 remaining ranges in the State sanctioned by the Texas State Rifle Association for championship matches. Please note that our Indoor Range is available only for scheduled matches: individual practice shooting in the Indoor Range is not allowed. The Club offers extensive Fall and Spring Junior Programs. Fall program registration is in early September; spring program registration is in early January. Check the calendar for exact dates and times, or contact the Club Junior Program Director listed on the Contact List. We urge all parents to obtain further information on the Club’s Junior Programs. It’s a great venue for getting young shooters involved in the sport, with proper training, safety, and direction stressed throughout the programs. Indoor Smallbore Rifle League runs from October thru April each year. League matches are either 3-position or prone format and are held on Tuesday evenings at the Indoor Range. Check the calendar for exact dates and times. Indoor Smallbore Rifle Matches are held each year during the winter months. The Club hosts junior and senior matches including3-position, 4-position and standing matches. We also host junior sectionals, senior sectionals, and one-half of the Texas State Indoor Position Championship each year. Complete information on these matches can be obtained by contacting the Match Director designated for each event. Please check the club calendar for complete details. Outdoor Smallbore Rifle League begins in May and runs thru September each year. League matches are held on Tuesday evenings. The course of fire is the Dewar Course as shot at the National Matches at Camp Perry, Ohio. The League shoots are a wonderful opportunity for the entire family to enjoy the challenge of smallbore prone shooting. Club equipment, including rifles, slings, mats, spotting scopes, jackets, etc. are available for beginners who don’t have their own. Simply come out and learn a wonderful sport. Check the calendar for dates and times or contact the Smallbore League Match Director listed on the Contact List for information. Outdoor Prone Smallbore Matches are conducted during the summer months. These are typically 2-day events, however we will occasionally sneak in a one-day match during the summer. Check the calendar for dates or contact the Smallbore Division Director listed on the Contact List for complete information.